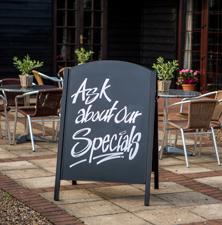 Chalkboards are a traditional point of sale marketing tool but remain hugely popular, especially within the leisure and hospitality sectors. They are a great way of promoting short term offers and promotions whilst adding a sense of warmth, personality and fun. 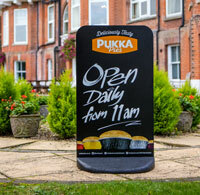 Signwaves has a chalkboard for every use and situation, indoors and out, available plain or permanently branded. The High Pressure Laminate (HPL) chalkboard sheet material that is used for the higher quality chalkboard products in the range is stocked in large quantities in a range of thicknesses. Specialist cutting equipment allows boards to be cut to virtually any shape and size complete with holes for wall fixing if required. Signwaves has mastered the difficulties of printing directly onto this material so that customers can achieve the perfect mix of permanent branding and ‘ownership’ with instant tactical chalk messaging. HPL is a superior chalkboard material that doesn’t wear out and never needs repainting. The antiglare surface is weather and scratch resistant, is suitable for use with traditional chalk and liquid chalk pens and is easy to clean with a damp cloth (traditional chalk) or proprietary window/surface cleaner (liquid chalk pens). The specially formulated melamine surface means that chalkboards stay looking new long after conventional alternatives have faded. It is not surprising then to hear that HPL is used in outdoor products such as the Ecoflex pavement sign and Premier Chalk A Board, being dense, stable and resistant to moisture absorption it doesn’t need to be fixed or framed to keep its shape or form. This makes it perfect for products such as these where the panel is self-supporting, slide-in and reversible or simply interchangeable which is perfect for chalkboards which function best when they offer the customer maximum flexibility. For tactical messaging at eye level that grabs a customer’s attention, Counter/Table Top Chalkboards are excellent. Commonly used to promote offers of the day or to entice people to try something different within a bar, restaurant or retail environment, these double-sided message boards are available in three standard sizes with permanently fixed hard wood bases in a dark ‘oak’ stain. Grip Chalkers are a stylish alternative to the Counter/Table Top board with ‘grip action’ aluminium bases for instant and fail-safe panel mounting. With a contemporary look at home in any upmarket style bar Grip Chalker bases can be permanently branded or finished in a different colour subject to quantity. Ease of panel change, whether to another chalkboard panel or any other rigid sign material upto 4mm thick, makes the Grip Chalker much more adaptable than its wooden based counterpart. 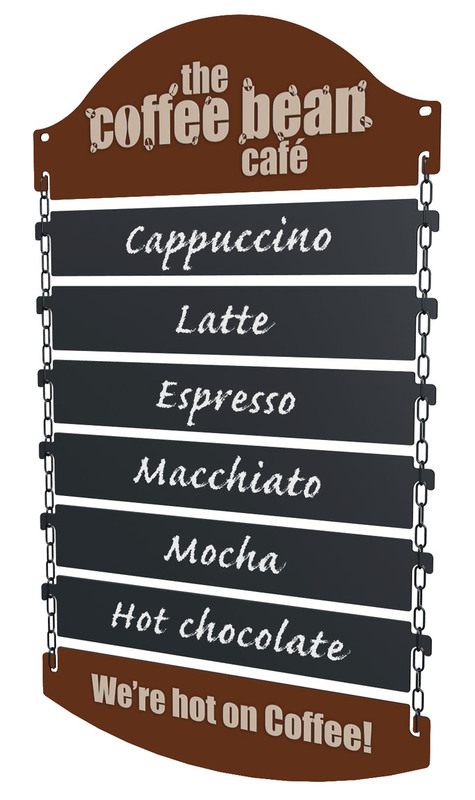 Slatted Chain and Slatted Magnetic Chalkboards, for suspended or wall mounted menu display, are a great option for businesses short on internal floor space. Designed with permanent branding in mind, both incorporate stylised header and footer panels as standard that can also be custom shaped for further individuality. Both board designs are double-sided and feature individual chalkboard slats that can be updated individually without disturbing the rest of the display. If you are looking for a simple, cost effective yet stylish internal wall chalkboard, the Mahogany Framed Chalkboard is a prime contender. Available in two sizes, it can be used to display bespoke messaging as well as being suitable for self-adhesive vinyl branding. A question often asked regarding chalkboards is whether chalk and rain are compatible? Using Signwaves liquid Chalk Pens there is nothing to worry about. One hour after application chalk pen graphics are waterproof and there is no chance of a message washing off without a firm wipe with a damp cloth. Top tip - Mr. Muscle Window and Glass Cleaner is an excellent chalk pen cleaner!